Memory – keyword of the Media-Performance 3 symposium – is understood as an intersection between live arts - events and processes - and media of recording and representation, from analog to digital. To reflect these relations requires taking into account the functions and politics of memory and remembering. The third symposium on MEDIA/PERFORMANCE took up the dialogue between Czech and German theoreticians of new media, art and science and of artists. It was preceded by symposia Fusion of Imaginary Spaces and On Ephemerality. 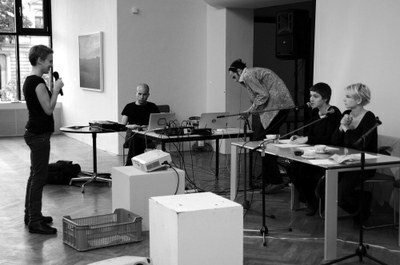 Assisted by Christine Rahn - House of Arts (Brno/Leipzig). 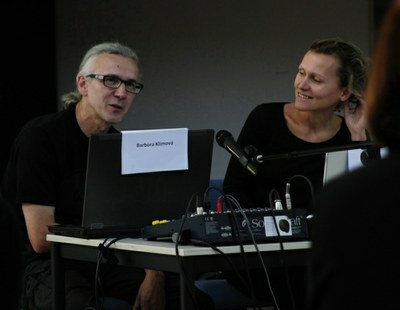 The symposium was supported by Czech-German Fund of the Future, Masaryk University, Leipzig Academy of Music and Theatre, The Brno House of Arts, 4AM Forum for Architecture and Media, AMU&MU Center for Primary Research, as well as by BMUKK Austria (Federal Ministry for Education, Arts and Culture). In recent years a remarkable number of exhibitions and performances have been dealing with reviewing and revisiting the performative arts of the 1960s and 1970s. They indicate a newly heightened interest in the historicity of these artworks and investigate the means of access to this history. While on the one hand exhibitions and re-enactments signify the institutionalisation and preserving of past events as well as their exploitation by the art market, their renewed staging and contextualisation also constitute new ways of appropriation. They represent a fluid approach to archives. They inquire about the nature of the artefacts on which old and new accounts of performances and their histories are based anew relevant and examine their readability in new contexts. The traces of performances are perceived as medial transformations. The technical, aesthetic and discursive circumstances by which they are influenced must be considered. Besides introducing some recent exhibitions and re-enactments dealing with the history of performance art and dance (e.g. MOVE.Choreographing You London/ Munich / Dusseldorf 2010-11; Art Lies and Videotape Liverpool 2003; Marina Abramovic Seven Easy Pieces New York 2005), the lecture will focus on aspects of media transformations and the readability of artefacts which transform historical events and actions into tangible information. References will be made to the discourses of ephemerality and disappearance as ontological aspects of performance. “What served in place of the photograph, before the camera’s invention? The expected answer is the engraving, the drawing, the painting. The more revealing answer might be: memory. What photographs do out there in space was previously done with reflection.” John Berger: About Looking, 1980. In my presentation, I follow ways of transposition and appropriation of Benjamin’s notions of reproduction and especially aura in a new media discourse. The ways in which Walter Benjamin’s concepts are transferred into the new media discourse will be illustrated by the question of translation understood as a result of relocation and by characteristics of the field of digital media memory, which is replacing historical knowledge and awareness. I claim that the aura of the artwork has not disappeared even as categories like original and copy have lost their relevance in the age of digital media, but it has transformed itself and has become part of new creative methods as are re-enactments. In the text On Some Motifs in Baudelaire (1939) Benjamin defines aura in close relation with memory functions, recollection, remembrance, and especially with “mémoire involontaire”. Thus I interpret aura not necessarily as a quality of certain media or artifacts, but as an ability, or disability to gain an auratic experience. The video made by Michael Bielicky, Crossings: The Last Passage of Walter Benjamin (2000) is a piece of media arts, which establishes its meaning by references to an auratic experience through re-enactment, to the cult of remembering in which the aura hides itself. The contribution will introduce specific aspects of the 1970s–80s private archives, examined from the perspective of the contemporary author in terms of intergenerational dialogue, collaboration, presentation and reconstruction. The presentation reviews the long-term research project Performing Memory on the relation of performance art to various kinds of documents and artistic practices of re-using and modifying documents and of examining and interpreting histories within their performative work. The project has been taking on different formats, according to space and media. One question was central to the two researchers Julia Kläring and Virginie Bobin: What are the specific means of performance as a mediation tool for history? The case example 37 Years Too Late will be shown by means of ‘real’ and ‘fictitious’ records, documents and testimonies. In four stages Kläring and Salzmann create an unconventional volume of material around a performance by Gina Pane, which nowadays is canonized and historicized in the art historical publications. Their strategy includes dubious giving of proof, even pure fiction, based on highly serious and detailed research. The first showing of Gina Panes "Selfportrait(s)" took place in Paris 1973 - but we haven't been there, we haven't even been born when she did her three-parted performance in the Galerie Stadler. In "37 Years too late. The Speech", you have now the challenge to see the exceptional speech of the three parts "The Conditioning", "The Contraction", "The Rejection". The three performers are undoubtful dubious figures, who disagree but at the same time they enjoy to remember the common evening in Paris. The performance is about the life of Mr. Roman. Moments from his life were recorded on the 8 mm format in a DIY way. These eight film reels showing the life of an unknown family became part of the film footage used in the previous work, a piece entitled EKRAN. This self-made film is now being used as main material in the project called Mr. ROMAN. They had fallen into oblivion for centuries but now they appear more up-to-date than ever: the Memory Theatres from the 16th and 17th century. Their attempts to revitalize the scholastically stifled memory culture of the Middle Ages and to counteract the sensory deprivation of the dawning age of print are rediscovered by information designers and artists who develop strategies of staging data as an alternative to storing them like dead objects. The lecture will discuss the Memory Theatres of Giulio Camillo (1480–1544) and Robert Fludd (1574–1637) under three different aspects: a magical, an encyclopedic and an inventive one. It will be shown that both the magical and encyclopaedic aspects cannot be transferred into the digital era because the metaphysics of a closed and centralistic cosmology that are presumed by them are no longer valid in any way. Therefore attempts to digitally adapt these arrangements are at best parodies of the original intentions – yet they occur in great numbers. They prove themselves to be rather a compensatory symptom than a cure for the digitally hypertrophied memory. On the other hand the inventive moment can certainly be updated when one transports the visual strategies by which the historic Memory Theatres used to stimulate the imagination of their visitors to the technologies of today. In this perspective there are remarkable examples of computer art that could be exemplary for future models of visualising and staging information. They give examples of how to oppose the static model of 'storage and retrieval' with performative ways of knowledge presentation. The ancient art of memory was based on associations between patterns or structures of images and a body of information in need of organization. This mnemonic skill was mainly used for rhetorical purposes; however, it also implied certain structure of knowledge and a way of understanding the world. The memory practices have considerably developed over centuries and become technological. The paper will describe several examples used in modern sciences and analyze the links between them and the paradigms of cultural understanding and methods of interpretation. Already in the 15th century, printing books had become very quickly an aesthetic challenge: How to put text on a page in a way to let the reader get its message? What use can be made of images? Until recently, the printed page has been a major medium which organized texts and structured the reading process. When we think memories, we still think pages, books and libraries. How come? Examples from the early days of printing show how pages are articulating and storing texts and are at the same time giving books a double life: closed and open. The talk examines the experimental work Sentences by Robert Grenier. This piece holds a rather unique position in the history of American literature – it was printed on index cards in only 200 printouts, now there is also an internet version. The form of Sentences and the text itself invite to take the piece as the narrator’s associations, memories, flashes of thoughts as well as the capturing of the events happening outside his mind and even through the chains of significations that offer, as Grenier writes, “the range of possibilities in actual existence”. The piece refers to the associative mind model by its textual qualities – fragmentary character, memory-like content, personal tone and autobiographical form. It also links to the concept of “oral consciousness” by the text's minimalism (that encourages being spoken, sung, re-read) and by the bird-shape of the box (bird as a metaphor for freedom, singing). Grenier, member of the Language Poetry group, focuses on the language itself as well as on its reference to the world. By drawing attention to the common language and thus to the common experience, one could say that he tries to capture the fascinating moment of the existing, the essence of “Dasein”. Marshall McLuhan: „All media are extensions of some human faculty – psychic or physical. The wheel is an extension of the foot. The book is an extension of the eye… Clothing, an extension of the skin… Electric circuitry, an extension of the central nervous system.” Does it really make sense to heap up this sort of arbitrary hook-ups on the overloaded human body (that, for no explicit reason, still occupies a central position in this game of extension)? Well, it certainly does not. At least not, if we look back at the less electric but more systemic hook-up of European metaphysics. Let’s examine the once deconstructed subordination of writing to speech. Surprising as it may be, it is not the highly cherished human faculty of speech which occupies that very central position in the best tradition of Western logocentrism. The speech is a mere substitute for memory and wisdom administered perorally by Saussure Pharmacy. The memory occupies a place of a smart villain of logocracy. The writing is meant to be an extension of memory. The memory seems to play an essential role in the relation between the speaking father and his writing son. Perhaps less surprisingly, she is a woman. Anyway, she happens to be widowed more often than not. What’s worse, she tends to be marsupial rather than mammal in her habits. Memories fill up folds of togas; they seize any medium soaking into porous body tissues. Memories choose pockets for places of residence and pockets of memory eventually become pockets of resistance. The story of Mrs. O., suffering from dementia caused by Alzheimer’s disease, is told through a combination of documentary film footage and her own video journals. The handy digital camera serves Mrs. O. to record instructions for different daily activities, memories, thoughts and commentaries on various events, trying naively to enroll/chronicle herself in the medium of film for further references in the memory-less future. Through the personal story of a gradual memory loss the film reflects the attitude of the post-communist society towards its recent history. Francis Hunger’s installations and performances The Setun Conspiracy (2005-2008), History Exhaustion (2009), Choir of the dead space travelers (2010) and Song for Henry Ford (2011) deal with the third industrial revolution, namely the all immersing computing technology, its actors, structures and developments. Hunger tells individual, fictional stories intertwining with larger narrations of history and society using a diverse set of newer and older media. Kontinuum N+N is an ongoing research and documentation about Netochka Nezvanova, a distributed personality that haunted the global electronic networks during the years 1999 to 2003, polarizing the online community with its radical software experiments before teleporting herself into digital oblivion. „Historiophoty“ is a term coined by Hayden White in the course of the polemics in the possibility of visual representation of history in cinema. In the wake of this debate, many studies of historical films have been carried out that have been inspired by the „historiophotical“ approach. In my contribution, I want to focus on the two fundamental epistemological assumptions that inform about this approach and argue that the position of historical film between the past and its visual representation can be better accounted for in the conceptual register of social memory. Barbara Büscher is professor of media studies / intermediality at Leipzig Academy of Music and Theatre. She is co-publisher of the online journal MAP – media / archive / performance (www.perfomap.de/current). Jana Horaková (born 1971) is associate professor for the Theory of interactive media at the Musicology Department, Faculty of Arts, at Masaryk University, Brno. She has studied Theatre Studies at Charles University in Prague and Masaryk University in Brno as well as Media Studies at the University of Lapland, Finland. She focuses on media art and performance art, historical and theoretical interrelations and on robotic art (Book: Robot as Robot, KLP: Prague 2011). Barbora Klimová (born 1977) studied at the Faculty of Fine Arts, Brno University of Technology (1998–2004) and the Higher Institute for Fine Arts, Antwerp (2004–2006). Through her projects she experimentally explores aspects of vernacular cultural history. The center of her long-term attention focuses on the social and political situation in Czechoslovakia in the 1970s and 80s. Julia Kläring and Andrea Salzmann have been working together since 2010. Together they conceived the 4-part project 37 Years Too Late, which deals with the documentation, adaptation and further development of Gina Pane’s Self-Portrait(s) from 1973. The project's parts have been shown at: FormContent, London; Kunstraum Niederoesterreich, Vienna; FLATZ Museum, Dornbirn; Brut Koproduktionshaus, Vienna. Andrea Salzmann (born 1979 in Bregenz) is a performer and photographer in the field of performance art. Julia Kläring (born 1978 in Vienna) is visual artist, performer, freelance curator, cartoonist and videographer. Peter Matussek is Chair (W3) for Media Aesthetics at Siegen University (since 2008) and has been guest professor in Korea (2003), Japan (2006), Indonesia (2010), and China (2010). Tomáš Dvořák, Ph.D. is a research assistant at the Institute of Philosophy of the Czech Academy of Sciences. He focuses on the philosophy and history of science and the philosophy and history of media and their interrelations. Ulrich Johannes Schneider is a historian of knowledge and a specialist on Michel Foucault. He translated Leibniz and Deleuze into German. Since 2006, he is the director of Leipzig University Library, curating book exhibitions in Wolfenbüttel, Leipzig, New York, and Houston. He is a professor of philosophy at the Institute for Cultural Studies at Leipzig University. Petr Šourek (born 1974 in Prague) is a philosopher, translator, art and theater critic, theater director and writer. He has studied philosophy, classics in Prague and Berlin, drama in Athens and new media at Georgia Tech in Atlanta, USA. He lectures history of theatre and multimedia. He regularly writes for the Czech press and translates from both ancient and modern languages. Viera Čakányová was born in 1980 in Bratislava. She studied at Academy of Performing Arts (VŠMU) in Bratislava – Department of Scriptwriting. She continued in her film studies later at Academy of Performing Arts (FAMU) in Prague – Department of Documentary Film. Her films Under Under Ground (2006), Červi/ Worms (2007) a Piraňa / Piranha (2007) which were succesfully shown on several international festival of short movies. The latter one was awarded the best documentary on FAMUfest 2007 – annual festival of student films of FAMU. Her last film till the date received award for the best student film at FAMUfest 2009. Christine Rahn, born in 1980, graduated in art history, cultural sciences and journalism at Leipzig University in 2008 (master thesis about Lutz Dammbeck's media collages in the GDR art scene). Since 2004 she has been a freelance assistant for various art institutions, many times e.g. for Gallery Jocelyn Wolff (Paris); founding member of the residency programme BLUMEN in 2006. 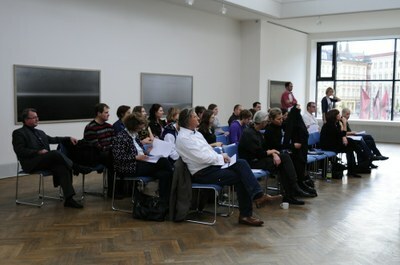 In August 2011 she started to work as Robert Bosch Cultural Manager at the Brno House of Arts. Radim Hladík is a Ph.D. candidate in Sociology at Charles University in Prague and a researcher at the Institute of Philosophy at Academy of Sciences of Czech Republic. He teaches film and social memory at the Film and Television School of the Academy of Performing Arts in Prague. He also works as editor for the Theory of Science journal. In 2009-2010, he was a Fulbright visiting researcher at the Department of Sociology at Columbia University in the City of New York.